The UK Royal Air Force Tactical Communications Wing (TCW) has used MOSKIT during the evacuation of UK, EU and other Nationals during the Sierra Leone crisis in 2001, when the UK military went to the aid of the United Nations. 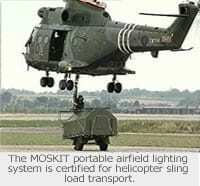 The MOSKIT was used at Freetown Airport to support the use of RAF Chinook (CH-47) and Hercules (C-130) aircraft when foreign nationals were evacuated to Senegal. The Belgian Air Force 15th Wing based in Brussels have used one of their MOSKITs for the evacuation of Belgium, EU and other nationals from the Democratic Republic of Congo (DRC) formerly Zaire in 1997. Since then their MOSKIT has been used on a regular basis for missions and operations within and around the DRC and other parts of Africa for humanitarian missions. A single MOSKIT can support a 1500mtr (5,000ft) runway for use by fixed and rotary wing aircraft. It contains sufficient runway edge lights, PAPIs and approach lights to support both VFR and NVG flight operations. Two trailer mounted generators remove the need for a local mains power supply. All equipment can be operated by radio control from the ATC tower or from a tactical air traffic controller on the airfield itself. It can be deployed in less than 20 minutes by three personnel and can be redeployed in a shorter time once the lighting is no longer required. MOSKIT is C-130 transportable and can be towed behind standard utility vehicles such as a Land Rover, HUMVVE and normal commercial utility vehicles.